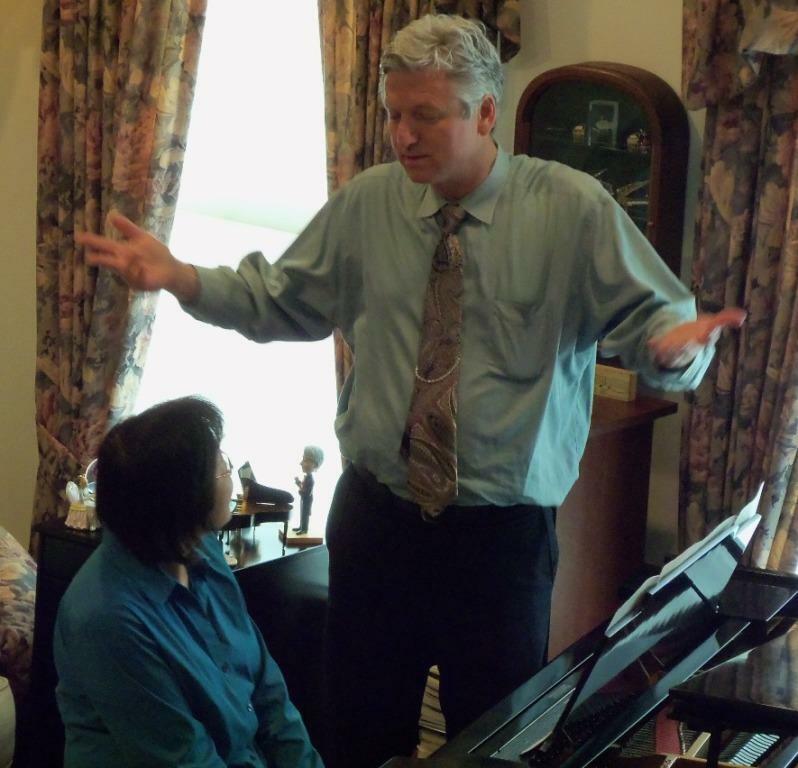 Brian Ganz once again treated AMSF members to a very informative master class at the home of Anne and Paul Williams. Thank you, Anne and Paul, for a delightful setting and gracious hospitality. And thank you, Dorothea Shellow, Special Events coordinator for AMSF, who introduced Brian, saying this was his 12th such Master Class for AMSF. 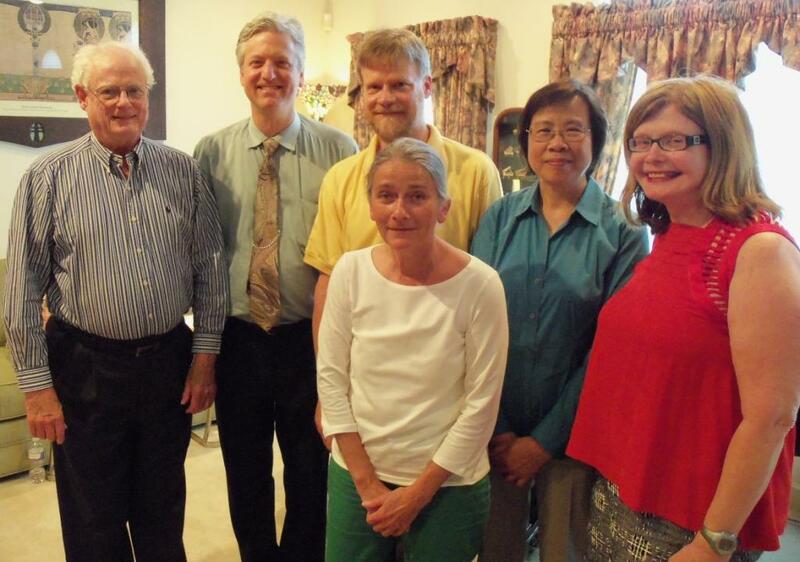 Brian Ganz with master class participants: Bart Kinlein, Brian Ganz, Patrick Shea, Susan Hill, Yelong Han and Katy Mead. During the master class, Brian discussed the following points to help attendees practice with greater conscious awareness and develop confidence in performing. Grounding. Feeling our feet firmly planted on the floor, our bodies "sinking" into our benches and feeling "home," can help calm nervousness as well as improve tone and rhythmic security. Grooving. Verbalizing aloud the note, chord, or passage one is practicing helps lodge the information into a "groove" of our brain. Brian cited the example of how we may unconsciously lock the front door and drive away but then worry along the way whether or not we've locked the door! vs. saying aloud "I'm locking the door today before I get in the car," etc. Weighty precision. If you can't play accurately at a slow tempo, you're in danger of "approximating the tempo and touch" and rushing during a performance. Silence. This refers to an awareness of the spaces and rests between musical notes. Brian cited Artur Schnabel who said that the music that lies in the spaces between the notes is as important or more important than the notes themselves. Altered consciousness. Playing for others alters our consciousness. Playing often for friends, family, or anyone who will listen will help us to become more secure in playing in that altered state. Stop practice. This refers to stopping a scale passage on a note just over a bar line, then when accuracy and comfort in doing that is achieved, adding notes one at a time until the complete scale passage can be played with accuracy. Five-step process. This technique involves playing LH alone, then adding the RH but focusing on the LH. RH alone, then adding the LH but focusing on the RH, then both hands together. Bart Kinlein was the first performer to play for Brian. 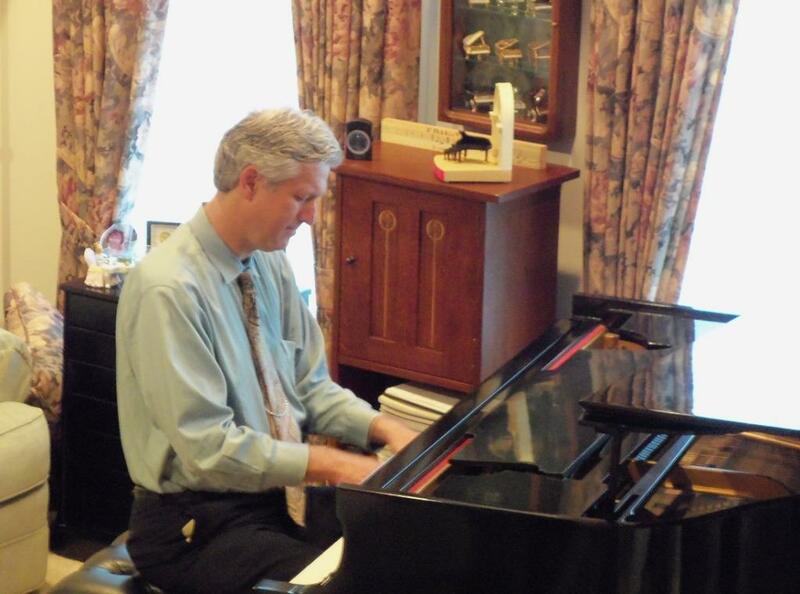 Bart played Beethoven's Allegro from Sonata Op. 2, No. 1. Brian complimented Bart on playing a difficult piece that was a work in progress and therefore had room for growth. He asked Bart to note the theoretical aspects of the music, saying that the more we know about the music, the more it becomes "grooved" into our consciousness. Brian recommended two music theory books, both available at Amazon.com--Kostka and Payne, "Tonal Harmony" (over $100), and "Idiots Guide to Music Theory" ($14). Brian asked Bart to play slowly to exaggerate the space between the notes, as well as the 8th-note rests. He suggested that Bart play the piece under tempo to feel the spaces, bar lines and beats evenly. Bart incorporated Brian's suggestions, producing a steadier rhythm. Yelong Han listens to Brian's suggestions. Yelong Han followed Bart, playing Debussy's Claire de Lune. Brian complimented Yelong on her pianissimo playing, feeling for the piece, and her awareness of Debussy color and shading. Brian worked mainly on asking Yelong to play more deeply into the keybed to deepen her tone as well as to become more grounded and less nervous. He asked Yelong to play "clusters" of any 5 notes, then one note at a time, using the weight of her forearm and a loose wrist to swing "into the key bed," letting the fingers stay in touch with the keys. He asked her to start the piece playing mezzo forte rather than piano and to ignore the tempo markings, using her whole body and taking plenty of time on the notes and chords. Brian asked the audience to clap the 8th notes while Yelong played and then asked Yelong to clap the 8th notes while swinging into the keys with the melody. These suggestions helped Yelong play with a richer tone and greater confidence. Katy Mead then played the Chopin Marche funebre: Lento from the Sonata Op. 35 by Chopin. Brian complimented her on her very musical playing and asked if she knew the history of this piece. Chopin wrote this movement before any other of the movements of the sonata, possibly thinking it would stand alone as a testimony to his grief over the end of an engagement to Maria Von Zinska, his Polish fiancee. Brian said that knowing background information on music we play further enhances our performance. Brian asked Katy to sing and play the melodic line while we clapped the 16th notes. Then Brian asked Katy to clap the rhythm while he played. Upon asking Katy to count 1e&a, 2e&a, 3e&a, 4e&a, the steady inevitability of the somber rhythm was more clearly delineated. Brian stressed the importance of hearing all the 16th notes in rhythm, even though not all of them are sounded. Brian claps the rhythm as Katy Mead plays for him. Susan Hill next played the Allegro movement from the Sonata in D Major, K 576 by Mozart. Brian complimented Susan on her contrapuntal sense in this late and "experimental" sonata of Mozart, the clarity of her playing and her softer, delicate playing when the movement becomes more homophonic. The chief difficulty of the piece is keeping the hands "out of phase" but accurate on the runs rather than letting the two hands devolve into playing octaves, which would be in phase. Brian suggested that Susan use a technique he calls "stopping" practice. Again, the space between notes is important to articulation in Mozart. 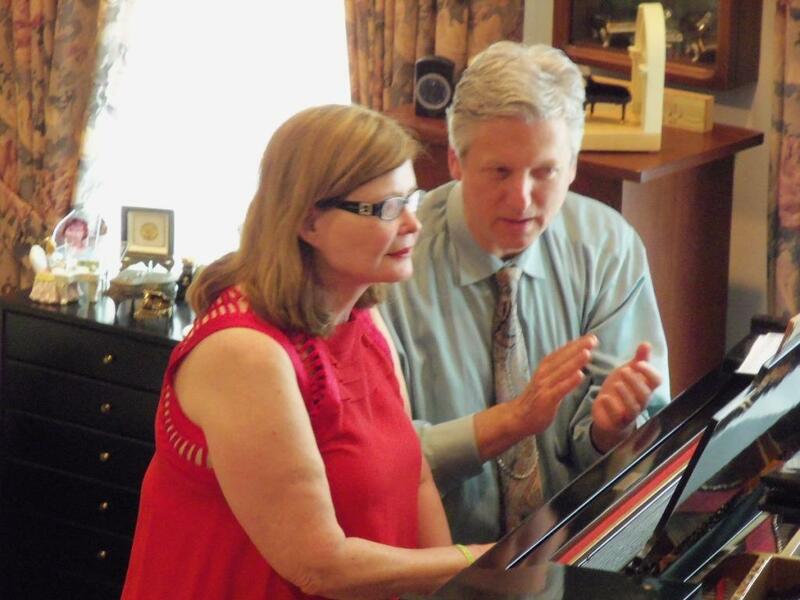 Brian asked Susan to be careful not to push the tempo in the 2nd section, to feel grounded, and to feel the breath. Susan was able to incorporate many of the suggestions Brian gave to great musical advantage. Patrick Shea finished with a beautiful reading of Ravel's "Tombeau de Couperin: Forlane". Brian asked him if he knew much about or had listened to Couperin and again stressed the importance of understanding the "back story" to our music. Brian worked with Patrick to hear and play the harmonies, playing very slowly from one chord to the next, ignoring the melodic line, playing chord clusters to hear the connection between the harmonies. Then Brian asked him to play and sing the melodic line by itself. Brian asked Patrick to feel the "dance" in his whole body, swaying, dance-like to the melody. Patrick commented that the orchestral version is played much faster than he plays it. Brian's response was that composers just "think the tempo" and often don't mean that pieces should be played as the edited marking indicates. Regarding repeats, Brian stated that we need "to find a way to tell the story differently" each time. As an example, he suggested that Patrick lean forward the first time a melody appears, as in "telescoping", then on the repeat, lean back as if in a kalidiscope, making the melody more magical, haunting, sparkling on the repeat. He reminded Patrick that he didn't always need to count if it "holds you back from using your body" and "dancing" with the music. He reminded Patrick that he needed to sense the pulse with his body to achieve the "dance-like" lilt of "Forlane"--which Patrick was able to do with great success. To our delight, Brian concluded the class by playing Chopin's Fantaisie Impromptu, Op. 66 (Posth. ), in C# minor. Brian Ganz treats the master class audience to a private performance.